Foundry’s designer says everything is specifically designed to feel welcoming. In just a couple of months, an ambitious and “transformative” youth mental health centre will open its doors in Kelowna. Foundry Kelowna is a “world-class” centre that will host representatives from more than two dozen youth mental health and addiction services. The centre is part of the BC Integrated Youth Services Initiative, and represents a monumental step forward in how the province cares for youth aged 12-24. As Mike Gawliuk of the CMHA explains, having multiple agencies operating under one roof means young people seeking help will no longer get bounced from agency to agency, as they try to navigate the “labyrinth” of a system that exists today. Gawliuk says dozens of young people have already fallen out of the often confusing and unforgiving system, but Foundry has the potential to change all that. Having 25 support agencies all in one place will be significant, but its the physical place itself that Gawliuk says makes Foundry so special. Created by Kelowna’s Evolve Design, the building is unlike any most clinic you’ve likely seen before. Bright colours are splashed across the walls, and plants and moss walls grow in the lobby. The entire building even sounds and feels different; the usual harsh lighting and echoing corridors are replaced by warmer tones and softer acoustics. Most would agree that the building is beautiful, but as Evolve’s owner Jules Galloway explains, its design is based on much more than pure aesthetics. Galloway is a firm believer in Foundry’s mission, and says she came into the project believing the physical space it occupied could contribute significantly to its success or failure. She says that, before anyone even put pen to paper, her firm did an unprecedented 100 hours of consultation with staff, parents and youth in the system. “One-hundred hours? Never before have we done that. Never before have we had that amount of input, that amount of stakeholders who have an opinion. It took us three months to get through it all,” she said. 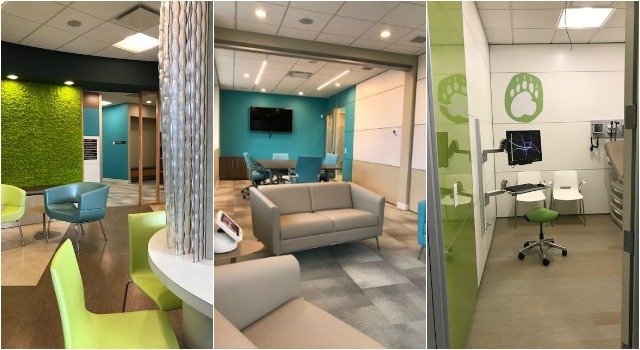 On a recent tour of the nearly-completed building, Galloway demonstrated how everything in the building is purposefully designed to make clients more comfortable. The reception area is a modern-looking room with a smattering of furniture scattered throughout. It’s an inviting space, but Galloway says it’s designed with much more than looks in mind. So while the room is welcoming, the furniture is also placed so the clients don’t have to sit facing someone else as they wait. There are booth-like places for groups, but there are also padded benches to lie down on, or spaces that offer a little more privacy. “All of the things have been built under the surface a little bit, so hopefully the intuition is that you don’t have to sit face-to-face with somebody, but perhaps they don’t notice that. Hopefully it just feels like a welcoming place,” Galloway says. Further into the building, movable walls will allow agencies to configure the space however best meets their needs. There is also an entire section that will be completely closed to clients, making it easier for the agencies working there to cooperate without worrying about confidentiality. There’s also surprisingly welcoming examination rooms, and a kitchen and lounge area Galloway says will be used for classes, projects and presentations. “Part of our mission at Evolve was to fully understand the space. We were given a blank shell, and we wanted to make sure no space was used less than 75 per cent of the time. Everything has to be constantly interchangeable. It has to be super flexible,” she said. Some agencies are already moving into the space, and more will begin to arrive in August. Gawliuk says Foundry should start accepting walk-in patients by the end of the summer, with the goal of a larger grand opening in the fall. More information on Foundry is available online.